Proxy pricing often requires life cycle cost analyses of capital expenditures; these include the costs of utilities, operations, maintenance, and replacement. 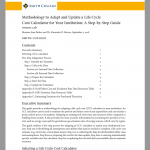 This section contains detailed information from Smith College on its implementation of a life cycle cost calculator, as well as a how-to guide detailing the process of adapting a life cycle cost calculator to your institution. Redistributive carbon charges come with their own complexities, as charging administrative units based on changes in emissions requires accurate baseline values for each charged unit. Without high-quality baseline data, units can be over- or under-charged, affecting charges and rebates for every other unit that participates in the program. For more detailed information on determining baseline emissions values, please contact Casey Pickett, director of the Yale Carbon Charge. 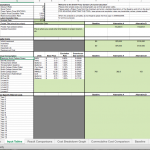 Spreadsheet calculator to support proxy carbon pricing based on life cycle cost analyses. The tool targets small institutions. A detailed guide to adapt the life cycle cost (LCC) analysis calculator to your own college or university. 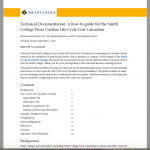 Detailed written guide for using the LCC calculator for Smith College. A similar guide can be adapted for users of the calculator at your institution. Life Cycle Cost Analysis Excel spreadsheet tool and video tutorial. Swarthmore and Vassar have adapted the spreadsheet to suit their institutions. The tool can compare the net present value and other financial and carbon metrics for different project options, given upfront costs, expected lifetimes, commodity costs and consumption, maintenance and labor needs and costs, and a carbon cost..